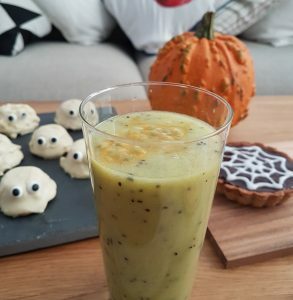 Trick your kids into slurping this healthy Halloween drink, with sweet pineapple, passion fruit and kiwi blended to look suspiciously slimy! I have used tinned pineapple chunks to keep the cost of this recipe down, but you could also use fresh or frozen pineapple chunks. For an extra boost of green, throw in a few spinach leaves. The kids won’t know and they’ll be delighted by the spooky colour. You will need either a hand-held or fixed blender for this naturally gluten free Halloween smoothie recipe. To make this naturally gluten free smoothie, peel and chop your kiwis into chunks and pop them into the blender jug. Add the pineapple, 3/4 of the passionfruit (the insides only – halve the fruit and scoop the filling, keeping a quarter of the seeds aside for the topping) and the apple juice. Now simply blend until smooth for 1 minute. You should still have little black kiwi seeds floating around after blending, which give a fab effect. If you prefer a chilled smoothie, you can also add a couple of cubes of ice and blend again. Serve the smoothie in a tall glass then scoop the remaining passionfruit seeds on top. These makes brilliant “frog spawn” to add to the pond slime effect. 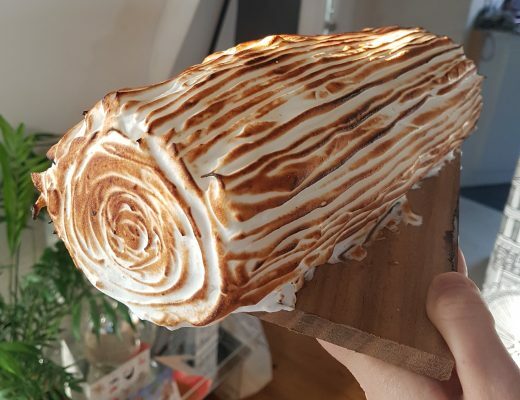 Ta da! 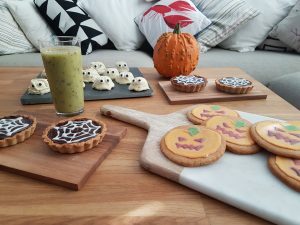 Make alongside my other halloween treats for a full party tables of treats: pumpkin gingerbread cookies, ghoulish cookie cupcakes and spooky spiderweb tartlets. Alternatively, try my more substantial butternut squash risotto recipe for a delicious, seasonal supper.